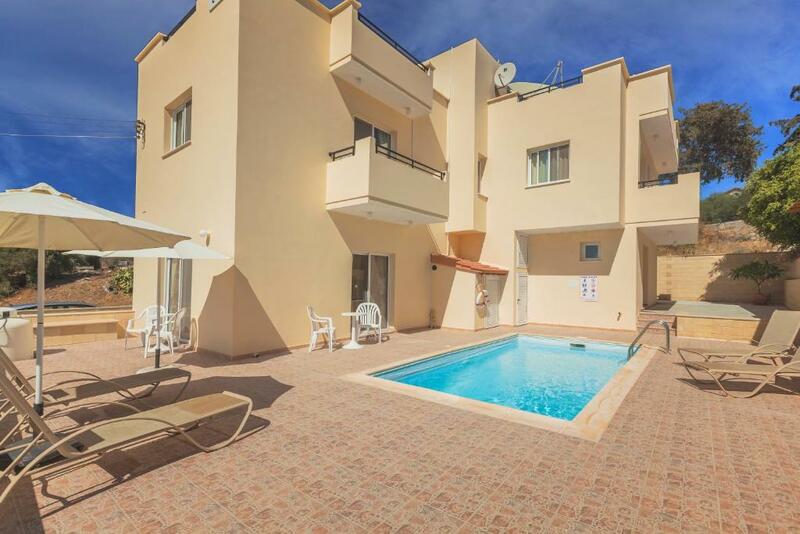 Thekla Court provides three self-catered apartments, located in the outskirts of Polis. These spacious apartments feature a private pool, views of the sea and the mountains and parking spaces. 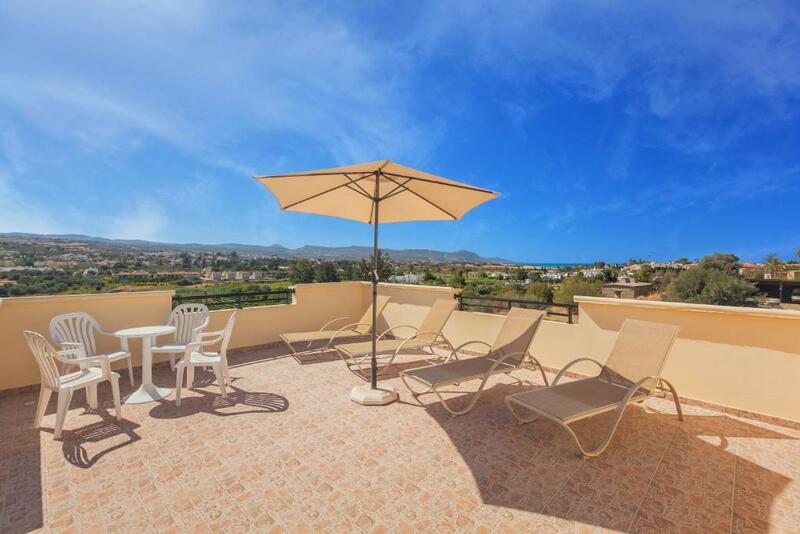 The property features a ground-level sun terrace and a roof terrace, both furnished with sun-loungers, tables and chairs ideal for sun bathing while enjoying unobstructed views of the area. Thekla Court consists of a 2 bedroom apartment and 2 separate studios, each with private facilities. First floor apartments have balconies. Guests share access to the pool, the surrounding sun terrace and the roof terrace. All apartments feature windows fitted with insect mesh, air conditioning, central heating, fitted wardrobes and entertainment systems including satellite TVs. 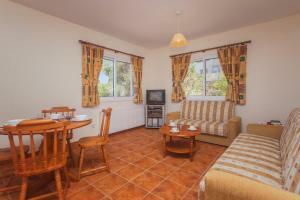 The kitchens are well equipped with a fridge, fitted oven, washing machine, toaster, kettle and kitchenware. Bath towels and bed linen are provided. The nearest beach is within 1.2 mi and the town center with its restaurants, cafes, banks and supermarkets is within 0.6 mi. Polis area, including Latchi fishing port, is popular for cycling, biking, hiking and snorkeling, sea sports and boating excursions. Akamas nature reserve is 6.2 mi from Thekla Court; Paphos International Airport is 21 mi away. When would you like to stay at Thekla Court? 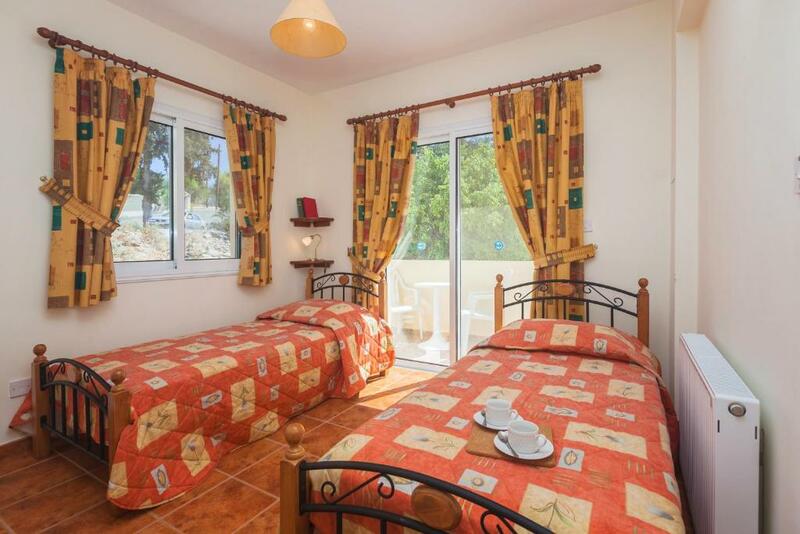 This studio features a living area, a fully equipped kitchen, air conditioning and a sun terrace. This studio features a living area, a fully equipped kitchen, air conditioning and view to the mountains and the sea. 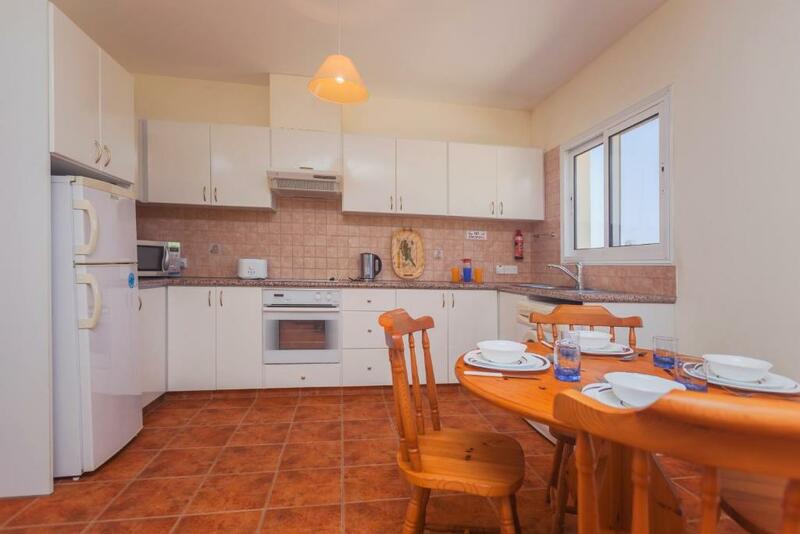 This air-conditioned apartment offers view to the mountains and the sea, two bedrooms, a living area and a fully equipped kitchen. 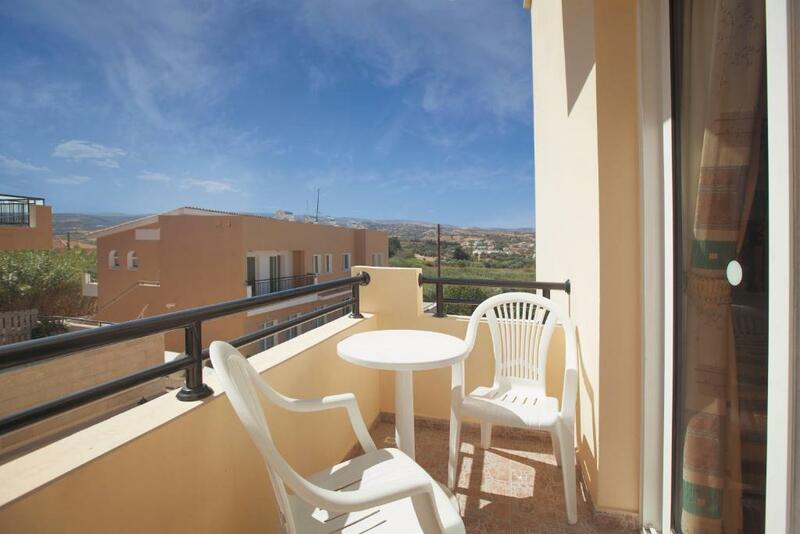 The location provides excellent views from all apartments and a gentle breeze for comfort on hot summer days. Thekla Court Apartments are light and airy, spacious, practical and very well equipped and with full kitchen facilities. It is a private property with 3 apartments only, ideal for couples, individuals, families, friends and extended families. Thekla Court is popular with many guests that have been coming many times over the years (both overseas guests and Cyprus residents) as well as first time visitors to Cyprus. 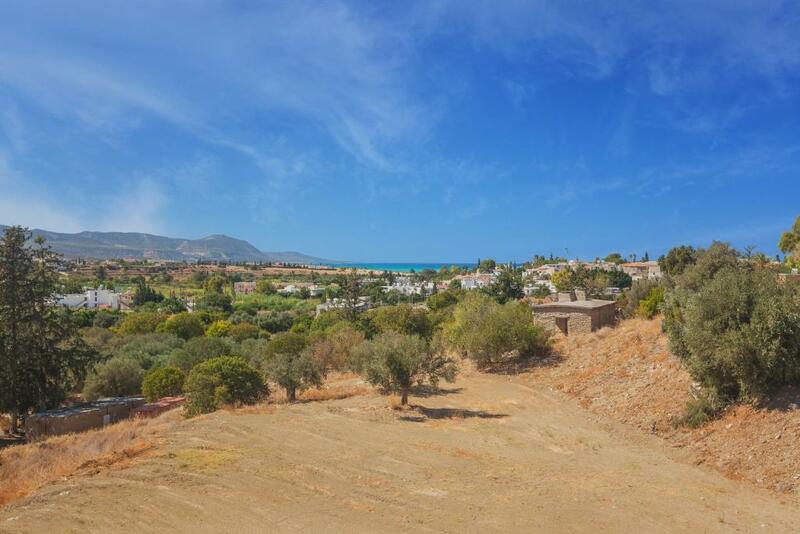 The property is on a hill along a quiet residential side road, within a short walk to the town centre. The spacious roof and pool terrace are fully equipped with sun beds, chairs and tables and are particularly attractive to sun lovers. The terraces are shared by the 3 apartments and have plenty of space for everyone. Thekla Court is our holiday home. Please look after it well when you are a guest at Thekla Court and leave it clean and tidy before you depart. The guest guide we send you will provide you with additional information. Please NOTE: we do not accept Stag Dos and Hen parties. When on holiday in Polis, we enjoy the sun, go swimming, walking, cycling, boating, visit local restaurants, cafes, markets for local produce, meet up with family and friends and visit the many nearby villages, the Trodos mountains and Paphos town. We also enjoy outdoor performances (traditional local entertainment, concerts, opera etc.) in Polis, Paphos ,Tala and other venues. The road, Smyrnis, leading to Thekla Court is a side road with limited traffic and residential homes and orange groves dotted along it. Polis is an authentic town, with friendly people, interesting architectures, with welcoming shops, supermarkets, popular restaurants (often with live music), banks, car and cycle hire, and all required facilities. It is popular with both visitors (many come every year) and local people and is pleasantly humming with activity. Chrisochous Bay1.5 km from Thekla Court offers lovely beach, excellent swimming protected by wind breakers all the way from Polis to Latchi, a lovely walking/cycling path (popular all year round) follows the beach too. Latchi has a fishing harbour, beach and many popular restaurants and cafes and a variety of shops. Boats can be hired here; sea trips for tourists are arranged, as well as water sports activities and trips to Akamas nature reserve by boat or 4x4 drives. Nearby are mountain villages and villages along the sea, all worth visiting and exploring but too many to mention. Access to the ones further out from Polis requires a car (or bus), but all of the local area can easily be seen by walking and/or cycling. WiFi is available in the hotel rooms and costs EUR 1.71 per 24 hours. House Rules Thekla Court takes special requests – add in the next step! A EUR100 damage deposit is required 14 days before arrival (about USD112.44). This deposit will be fully refunded 14 days after check-out, as long as there isn't any damage to the property. Payment before arrival via PayPal is required. The property will contact you after you book to provide instructions. Please note that guests need to bring their own beach and pool towels. Please note that the damage deposit is 100 EUR for each Studio and 200 EUR for the Apartment with Balcony. Please note that events and parties are not allowed. A damage deposit of EUR 100 is required. The host charges this 14 days before arrival. That's about 112.44USD. This will be collected by PayPal. You should be reimbursed within 14 days of check-out. Your deposit will be refunded in full by PayPal, subject to an inspection of the property. We need at least 5 reviews before we can calculate a review score. If you book and review your stay, you can help Thekla Court meet this goal. I think, arround the pool, toilet by the pool, roof terras and balcony could be cleaned. The appartment was really nice and big. It was close to the town. Water in the pool was just perfekt.